All toothpastes are not created equal. With that in mind, how is someone supposed to decide from the hundreds of toothpastes available? Your friendly dentists at Delaware Periodontics have several suggestions to help you navigate the many choices and select the right option for your teeth and dental needs. Stop by our offices in Wilmington and Dover, DE to learn more about which toothpaste is right for you! Toothpaste plays a pivotal part in your dental health. In general, toothpaste helps by removing bacteria and plaque while you brush. As a result, using toothpaste helps prevent gum disease, tooth decay, and bad breath. Toothpaste can also be an important source of fluoride, which is known for its cavity-fighting abilities. 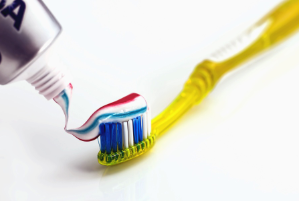 The American Dental Association (ADA) states that using fluoride toothpaste to brush twice a day is one of the fundamentals of oral hygiene and health. Do your teeth need whitening? Do you have sensitive teeth? Hoping to prevent tartar build up? Look for toothpaste labels that tell you their specific purpose and narrow down your options! Again, fluoride is a powerful ingredient for fighting cavities and strengthening tooth enamel. Baking soda provides an effective cleaning while being gentle on the teeth. Toothpastes with baking soda bases may be a good option if you have sensitive teeth. Look for toothpastes with the ADA seal of acceptance. These brands meet strict standards, which means you can be assured of high-quality toothpaste. Now that you have narrowed down your options considerably, you should base your decision on your likes and dislikes. Compare the offered flavors and textures. Don’t be afraid to experiment with different options until you find the toothpaste that works for you. While this list is meant to make the picking process less overwhelming, don’t think you need to make the choice on your own! Our dentists at Delaware Periodontics are eager and able to tell you the best toothpaste options on the market and, more importantly, for your specific dental needs. Toothpaste is one important piece of your dental health, but it can’t succeed on its own. 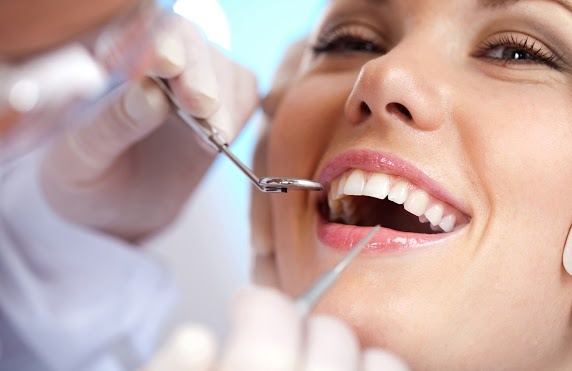 Delaware Periodontics provides high quality dental care to keep your teeth healthy and happy. Whether you have specific needs, such as dental implants, or just need a routine checkup, call today to set up an appointment. With locations in Wilmington and Dover, Delaware Periodontics is ready to serve you and your family. We can’t wait to see your smile! The Latest In Oral Hygiene: Meet Water Flossing! The key to a healthy smile is a regular oral hygiene routine that consists of brushing and flossing at least twice a day. However, if you ask most people, they are bound to tell you that while they brush religiously, they usually forego the floss—except, of course, on days that they're scheduled to visit the dentist. Yet flossing once every six months is not enough to maintain a healthy, dazzling smile! If you dislike flossing and are interested in a better way to keep your teeth clean, strong and healthy, talk to our periodontist in Dover about the magic of water flossing. Water flossing is far more effective than traditional flossing, and studies show that it can remove up to five times the amount of plague than string floss. Additionally, string floss is difficult if not impossible for orthodontic patients to use effectively, but water flossing successfully gets right between the brackets and wires of braces and effectively removes plaque build-up in hard-to-reach areas. Because of its ease of use and effectiveness, even dental professionals throughout Wilmington and Dover rely on oral irrigators to deep clean patients' teeth. If dental professionals use the technique, you know it has to have some merit! 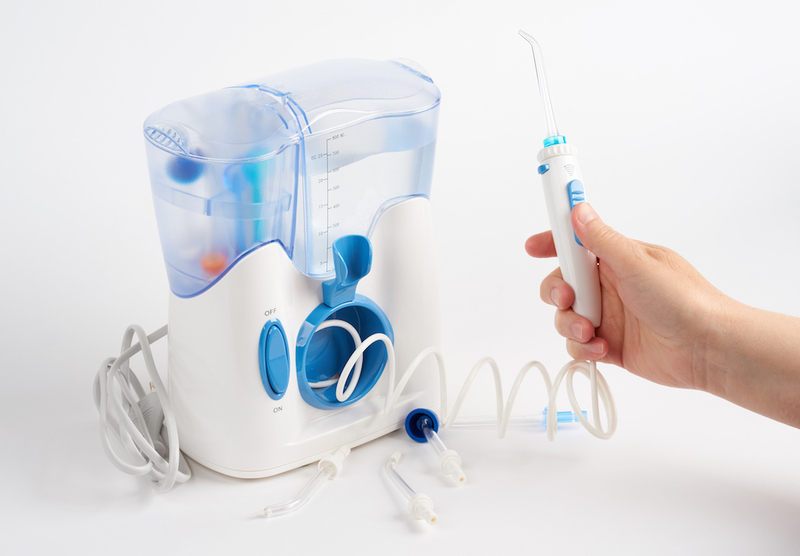 If you forego flossing on a regular basis, you may benefit from an oral irrigator. Talk to our Dover periodontist about what to look for in equipment and how to properly use the device. Call Delaware Periodontics at (302) 658-7871 or request an appointment online to schedule your consultation today. At Delaware Periodontics, Dr. Klassman and his professional team are proud to offer expert periodontal services and treatments to our Dover and Wilmington area patients. Many people develop gum disease at some point in their life. However, regular visits to your Dover, DE periodontist, good oral hygiene and a healthy diet can help you prevent it. Here are a few foods that help prevent gum disease. We all know that leafy greens are good for our health, but did you know they can actually keep your mouth and gums clean and bacteria-free? This is due to the fact that leafy greens such as spinach, kale, and others contain loads of healthy vitamins, minerals, and antioxidants. Vitamin C reduces inflammation and boosts the body’s red blood cell production. Furthermore, eating leafy greens also requires your mouth to produce more saliva, which then helps break down the bad bacteria in your mouth. Surprisingly, lean beef is an excellent food that can combat gum disease. Lean beef is chock full of zinc and vitamin B6, which both provide anti-inflammatory benefits. These vitamins and minerals act as antioxidants and help boost the immune system, all good gum disease fighters. Milk, cheese and yogurt are essential to healthy teeth and gums. They contain high calcium content, as well as Vitamin D, which both work to strengthen teeth. When your teeth are strong, they are less prone to unhealthy dental issues such as gum disease and cavities. Sweet potatoes contain high amounts of beta-carotene, which helps the body build up vitamin A. When gum disease develops, it causes inflammation. Vitamin A fights this inflammation and if the body is already full of Vitamin A, gum disease has a very low chance of progressing. An apple is a delicious snack, but did you know that eating an apple also cleans your teeth and prevents bacteria and plaque buildup? Apples are similar to leafy greens in that they also require the mouth to produce more saliva which naturally cleanses the mouth. They are also very high in vitamin C, which is an anti-inflammatory vitamin that keeps your gums at their healthiest! Contact Your Dover, DE Periodontist! Our friendly and welcoming staff is always available to discuss any of your questions or concerns related to gum disease and how to prevent and treat it. To learn more about the Dover, DE services we provide, including laser periodontal therapy, we encourage you to call us at (302) 658-7871, or reserve an appointment now using our handy online scheduling form. We can’t wait to hear from you! 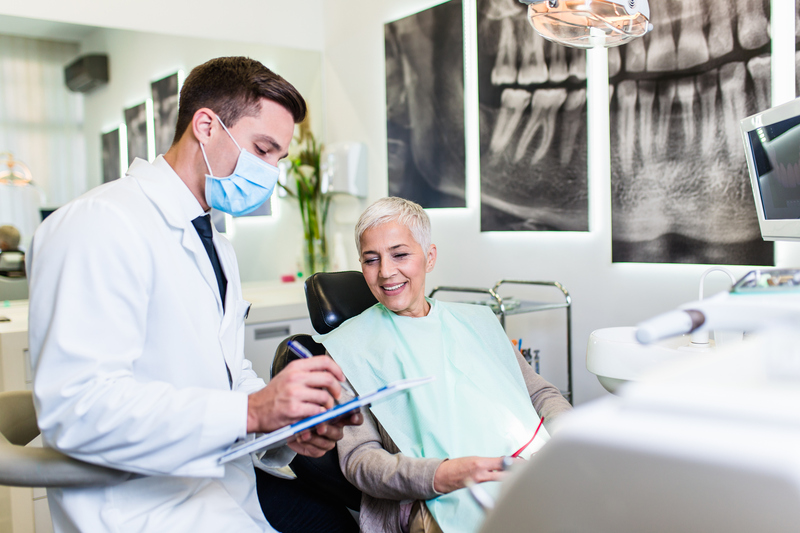 If your periodontist has recommended that you undergo dental implant surgery, you may be afraid that the process will be painful both during or after the procedure. While this is a common concern, the vast majority of most patients have stated that surgery is in no way painful and the recovery involves minimal discomfort. If you're still hesitant, we’ve outlined the procedure below, and you can always ask Dr. Klassman for more details if you’d like. The dental implant surgery process takes place over the course of several months and several visits. The first part of the process involves placing the implant into the jawbone using a screw. The screw will integrate with the jawbone via a process called osseointegration. The goal is to replace the original tooth root with an artificial one. Once the implant is placed, the gums will be sutured using stitches. The implant will then be allowed to heal for three to six months. If necessary, your Dover periodontist will place temporary crowns so that you can eat, drink and smile in comfort. Next, an abutment will be placed on the implant. The abutment serves as the base for your new tooth. An impression of the base will be taken and used to create your new implant. Finally, after an impression is made and the healing process complete, the implant cap will be placed, giving your smile an all-natural, finished look. Will There Be Pain During or After the Procedure? As with all surgical procedures, you are likely to experience some degree of discomfort during the recovery process. That said, you may experience slight bruising along the gums, pain at the implant site and minor bleeding. You may feel tenderness or swelling around the chin and cheeks and underneath the eyes. However, the pain is manageable with Ibuprofen and other over-the-counter pain meds. You should not feel any pain during the surgery itself, as a local anesthetic is used to control the discomfort. If you are nervous about the surgery, a more intense sedative may be used. Contact Your Local Wilmington & Dover, DE Periodontist! Everyone responds differently to dental implant surgery, but for the most part, patients report that the procedure is relatively pain free. To learn more about the process and to determine whether or not it is right for you, call Delaware Periodontics at (302) 658-7871 or request your appointment online. We look forward to hearing from you soon!